"The nature of man, even in this day and age, hasn't altered at all. You still fear the unknown, like everyone else before you." 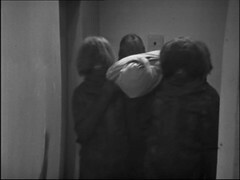 The Tardis crew are imprisoned while Steven represents them at their trial where he pleads for the Doctor to be allowed to investigate before Steven succumbs to it as well. The Guardians are ready to execute them before their ailing commander intervenes. 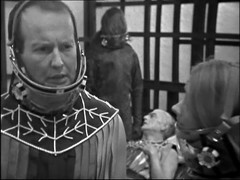 The Doctor comes up with a treatment and synthesises a vaccine. 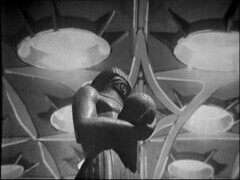 The Tardis crew watch the Earth destroyed and then leave, re materialising on exactly the same spot to find the Guardians gone and the statue completed but sporting the head of a Monoid. Most of this episode is a little pedestrian with the trial and treatment scenes confined to the main body of the Ark, but we get the Jungle back in the closing minutes. ZENTOS: That's another victim. Another death. And more human Guardians have also been taken ill. Thank heaven none of them has died yet. MANYAK: What will happen if one does? ZENTOS: It'll be disaster. Each man has his allotted task. No one had reckoned on this eventuality. Is there no redundancy in roles on the ark? What happens if someone is killed? And if the voyage does take 700 people will die and need replacing. They've got the idea that this is a generational mission illustrated to us by having Children present in many of the crowd scenes so there's got to be some forward planning and training for the voyage going on. Mind you Zentos is quick to step into the breach left by the ailing commander and obviously wants the job! 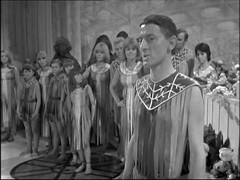 The main thrust of this episode is xenophobic attitudes on display by most of the Ark's inhabitants and command staff. BACCU: My contention is that it was no accident that this disaster has happened. I say that you came here intentionally to spread the disease. BACCU: And that you are agents of the planet towards which this spaceship is proceeding. That you came here to destroy us. STEVEN: Why? We're human beings like you are. Why should we? ZENTOS: There is the crux of the matter. Do you expect us to believe that nonsense, that you manage in that ridiculous machine called the Tardis, have managed to travel through time? Guardians, Monoids, these beings, whatever they are, place a heavy strain on our credulity. STEVEN: Well that's not very difficult! If your medical records are anything to go by, this segment of time, far from being one of the most advanced in knowledge, is one of the worst! 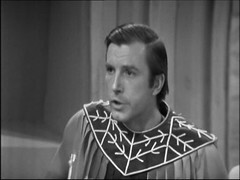 ZENTOS: We can cope with all things known to the fifty seventh segment of Earth life, but not with strange diseases brought by you as agents of the intelligences that inhabit Refusis! STEVEN: Are you still on about that? I've told you before. We know nothing of that planet. ZENTOS: My instinct, every fibre of my being, tells me differently. STEVEN: And that, unfortunately, tells me only one thing. STEVEN: That the nature of man, even in this day and age, hasn't altered at all. You still fear the unknown, like everyone else before you. MANYAK: Steven, prove to us your good faith. Would your friend, the Doctor, have any knowledge how to deal with this fever? STEVEN: Yes, he probably would if you'd let him out of that cell so that he had a chance to experiment. ZENTOS: Yes, of course he would. He would love that and by such means spread the fever even further and faster. Perhaps even kill one of the Guardians. BACCU: Guardians, listen to me! 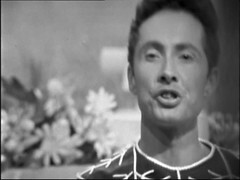 I've just had news of another disaster. One of our kind, one of the Guardians has died from the fever. ZENTOS: Doctor, for the fact that I mistrusted you, misjudged you, I'm sorry. DOCTOR: Remember your journey is very important, young man, therefore you must travel with understanding as well as hope. Goodbye, Zentos. DOCTOR: Ah, thank you, thank you. You know, you're far more knowledgeable than most people realise, aren't you? DOCTOR: Oh, thank you, thank you, yes. You know, I don't know what I would do without you. 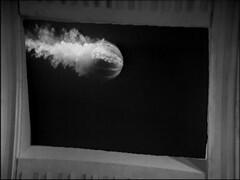 And in the middle of all the action we get to see the Earth die, burnt up and trailing smoke in it's orbit, a theme the new series returns to in it's second episode, End of the World, where various dignitaries gather to watch the Earth's demise. The very end of the episode is superb, subverting form by having the Tardis return to where it's left when you think the story is over. 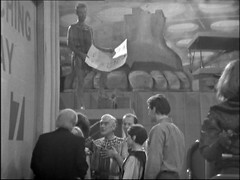 We saw the statue's feet, and plans, briefly in the last episode where it appeared as background details m("Hang the gun on the wall") Here' it serves to tell us that some amount of time has passed and that something has happened on voyage for it to acquire the head of a Monoid in place of the planned human head. Both director Michael Imison and writer Paul Erickson are also making their Doctor Who debuts here. Erickson requested that the episode be jointly credited to his then wife Lesley Scott but I believe that there's little evidence to suggest she actually wrote any of it which is a shame because she's the first credited female writer on the show.